Genuine GM Fluid 88900402 Auto Trak II Transfer Case Fluid - 33.8 oz. Extremely fast shipping! Excellent seller! 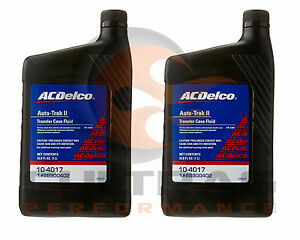 This product is 100% authentic ac delco transfer case fluid. Same as can be bought from a dealer, at a more reasonable price. This is a great fluid for transfer cases that must use it! Replaced old oil and new is working jist fine.